When I was a kid, G.I. Joe was exactly that - a G.I. He could be in the Marines, or the Army or the Navy or the Air Force...but he was all military. Even when he was an astronaut, he had that military feel. By the 70's, he had gone Indiana Jones on us, in response to America's attitudes toward war. 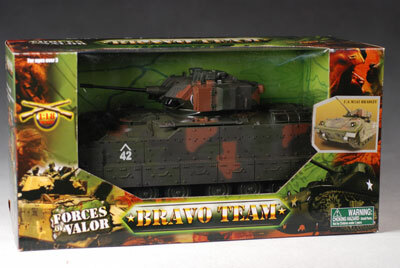 Today, finding military action figures is tricky, but a few companies, including Unimax, are keeping the theme alive. 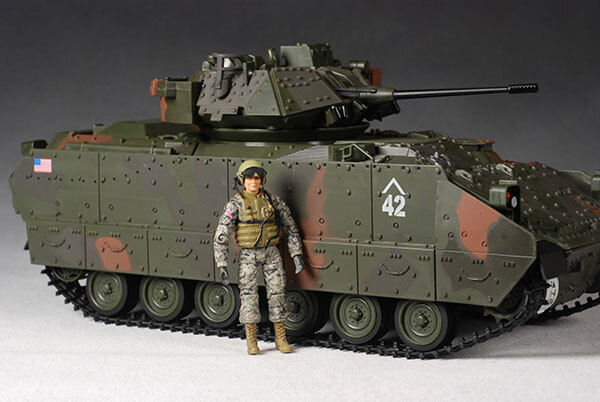 They are producing several lines under their Forces of Valor banner, and tonight I'm looking at the 1:18 scale Bradley Tank. This is part of the Bravo Team, and I'm using one of the Bravo Team figures to show scale, and I'll be reviewing a few of the figures in the next week. You can pick up this bad boy at Target for just $20. Unimax has some excellent figures in historical warrior style coming out later this spring, and I'm really looking forward to some amazing 3 3/4" knights! The box does the job of keeping the tank safe, although it has the usual mass market problem of being mighty tough to get the vehicle free. The graphics are good, and there's some background text, but I would have liked to see some features shown. There's several things the tank can do that is not apparent from the package. 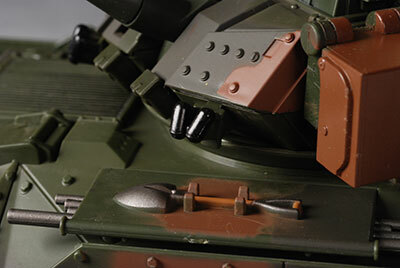 The tank has great detail, particularly for the price and scale. 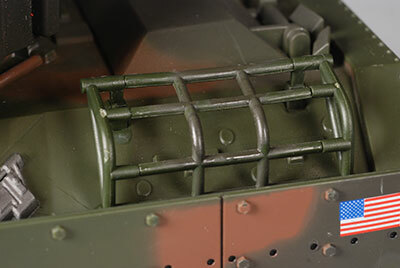 The surface is covered in rivits, with handles, doo-dads, lights, covers, grates, and various attachments sculpted on. 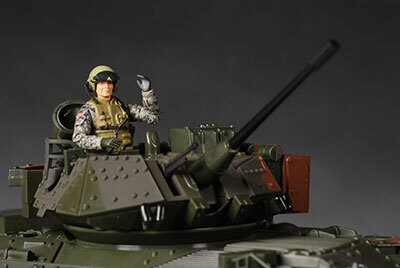 I'm not a military vehicle expert, but the scale here with the 1:18 figure looks quite good, and the figure fits nicely in the turret on either side. He doesn't sit in the back quite as well, but at least he does fit. 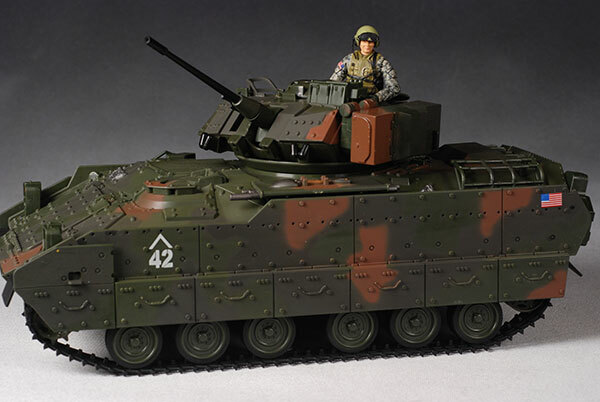 Is this an exact replica of a Bradley? I checked it against some photos, and no - it's not exact. It's pretty close though, particularly for a mass market toy. The paint work isn't super detailed, but let's remember that this is a toy first, collectible second. This kind of item is for the toy collector and the kid, not the person looking for an absolutely perfect reproduction of a Bradley. Still, there is more paint ops than you might expect with a mass market toy. There's some nice variation in the exterior paint, and the small details like the flags, numbering and sculpted permanent attachments are painted nicely, and the application is fairly clean and neat. The vehicle has several movable parts. 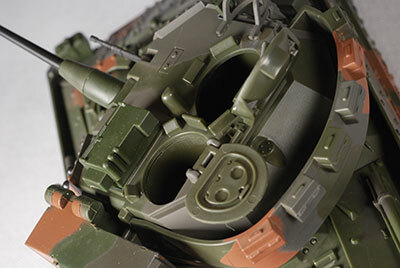 The turret turns, the guns raise and lower, both compartments in the turret open up, the back door drops to reveal a compartment, and best of all, the tank treads roll along the wheels, just like the real thing. All of these features work nicely, with sturdy hinges and tight seals. Most kids will be able to work with the tank with ease, and breakage with regular play is unlikely. The tank doesn't come with any extras, but that's not particularly surprising for a vehicle. Most don't come with Accessories, but I thought I'd mention it in the spirit of full information. This is a GREAT toy. This will roll through the sand box, you can clean it up with the hose, and it will STILL look terrific. 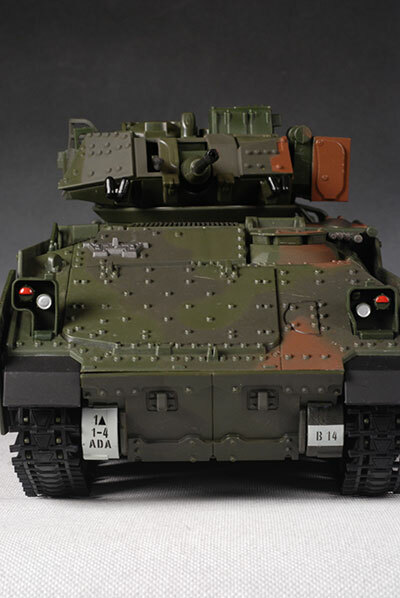 It's sturdy enough for an eight year old to take it through its paces, but a military toy collector can easily use it for a terrific looking diorama. What more could you ask for? At just $20, the tank is quite a good value. Most vehicles in this scale would cost $10 or so more than this, and would be less sturdy and less fun. Some items are merely toys, intended only for kids. Other items are only 'collectuble', intended for adults alone. 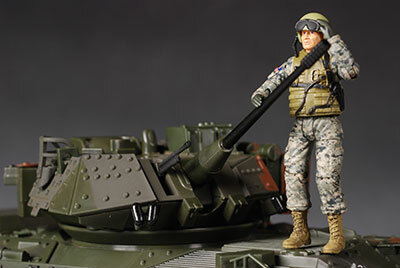 The beauty of something like Unimax's Forces of Valor line is that the figures and vehicles can be BOTH. They quality of the sculpt and paint are good enough for collectors and diorama builders, and yet the sturdy quality and sensible play features make them perfect for kids. I'll be covering several of the 1:18 figures in the next week, and I'm really looking forward to the new line of historical 1:18 figures they'll have coming out in the sping. Hit your local Target. 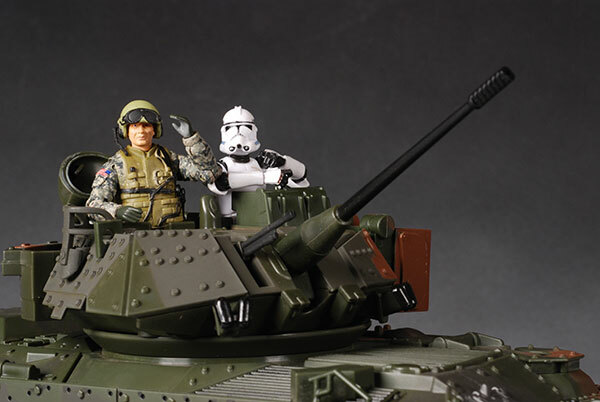 The tank runs $20, while the figures are just $5 each. 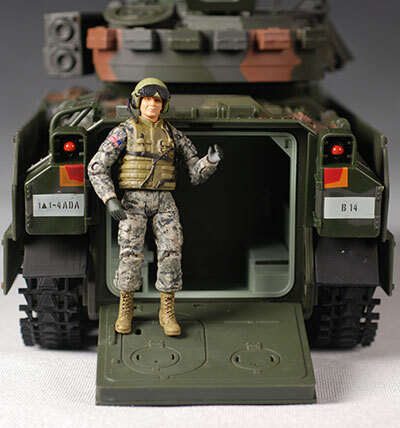 I've covered a few military items in this scale, including a guest review of the 21st Century tank from a few years back, and a guest review of one of the Elite Force figures. - and don't forget McToys military figures, including these guys from series 5, the Marine Recon figure, and the 12" version of the Paratrooper. I had a guest review of series 4 as well.